Underground cables are used for power applications where it is impractical, difficult, or dangerous to use the overhead lines. They are widely used in densely populated urban areas, in factories, and even to supply power from the overhead posts to the consumer premises. The underground cables have several advantages over the overhead lines; they have smaller voltage drops, low chances of developing faults and have low maintenance costs. However, they are more expensive to manufacture, and their cost may vary depending on the construction as well as the voltage rating. The underground cables are classified in two ways; by the voltage capacity, or by the construction. The cores in the belted underground cables are not circular and are insulated by impregnated paper. The cores are generally stranded and may be of non-circular shape to make better use of available space. In a 3 phase cable, the three cores are grouped together and then belted with the paper belt. The gaps between the conductors and the paper insulation are filled with fibrous material such as the jute. This makes the cable to have a circular cross-sectional shape. A lead sheath is used to cover the belt hence protect it from moisture and provide mechanical strength. The lead sheath is then covered with a single or multiple layers of an armoring material and finally an outer cover. Since the electrical field in the three core cables is tangential, the paper insulation and the fibrous materials are subjected to the tangential electrical stresses. This stresses weakens the fibrous material as well as the resistance and dielectric strength for the insulation along the tangential path. The weakening of the insulation may lead to the formation of air spaces in the insulation. Under high voltages the air may be ionized and cause deterioration and breakdown of insulation. For this reason, the belted cables are only suitable for voltages up to 11KVa and not higher. Due to the large diameter of the paper belt, bending the cable may lead to the formation of wrinkles and gaps. There are two types of screened cables; the H type and the S.L type. In a typical 3-core cable, each of the three cores is insulated by impregnated paper and covered by perforated aluminium foil or other metallic screen. The arrangement of the cores is designed to allow each of the three metallic screens to make contact with each other. The three cores are then wrapped around using a conduction belt made of copper woven fabric tape. 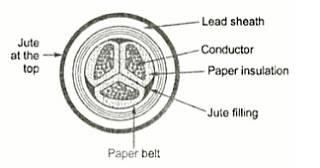 The H-type screened cable does not have an insulating belt; however, it has the lead sheath, followed by bedding, armoring and a then a serving. The core screens in the cable are all electrically connected to both the conducting belt and the lead sheath. This ensures that they are at the earth potential and all the electrical stresses are therefore purely radial, hence reduced dielectric losses. Disadvantages H-type cables : the cables are only suitable for low and medium voltages of up to 33KV, but can reach 66KVA at times. The S.L type cables construction is almost like that of the H-type, however, each of the insulated cores is covered separately with its own lead sheath. Unlike the H-type, the S.L screened cable does not have an overall sheath, however it has the armoring and serving. These are high power cables used for voltages above 66KV. The cable construction is different from the above two and majority uses a cooling gas or oil. Not susceptible to shaking and shorting due to vibrations, wind, accidents, etc. Poses no danger to wildlife or low flying aircraft. Underground cables are suited for places where it is difficult to use overhead lines due to obstructions and dangers presented by the overhead lines. There are different types of cables mostly constructed to handle a certain range of voltages. Each of the cable type has its advantages as well as disadvantages. However, the overall advantages of underground cables outweigh their disadvantages. Do you have anything to add to this information? Tell us in the comments below! or copy this trackback: http://engineering.electrical-equipment.org/others/underground-cables-advantages-disadvantages.html/trackback from your own site. On one of the advantages of using underground cables you mansion that : Not easy to steal, make illegal connections or sabotage. mostly copper is a preferred conducting material for underground cables. And over the last couple of years this material has gained a tremendous scrap value increase to a point that is is highly stolen on underground networks. This practice is highly dangerous to the culprits but still it quite happens a lot. looking forward poses a thought of whether is copper gonna continuously be used in underground cables or is it about time we investigate the betterment for using aluminum as a conducting material? my question is mainly based on MV cables. Thanks for the info! I’ve been wanting to learn more about underground cables! The main disadvantage of overground cables is the untidy look it gives. This is also the advantage of underground cables. The second is the safety aspect. UG cables are far safer. The third major advantage of UG cabling is that it is far less prone to faults and thefts of power. However, one of major disadvantage of UG cabling is the higher restoration times and costs required for repairing faults. Also agreed with Manelisi from above that copper has become a lucrative material for thieves. But they are more frequently stealing the telecom tower RF cables than the UG power cables because of the latter being easier to access and also far less life-threatening than UG power cables and the requirement of digging up large pits to access the cables which makes it difficult to camouflage thefts. Underground cables must have more durability than any other cables. They need a longer life. Its a great article considering all the important points.